Hiking trails - see our Facebook photos for photo-guided hikes. Shaver Lake Real Estate & Rentals has a nice web page devoted to hikes. Mountain biking at China Peak ski resort. Biking info doesn't show during the snow season. Museum of the Central Sierra at Shaver Lake. See the 2017 flyer here: side one - side two. 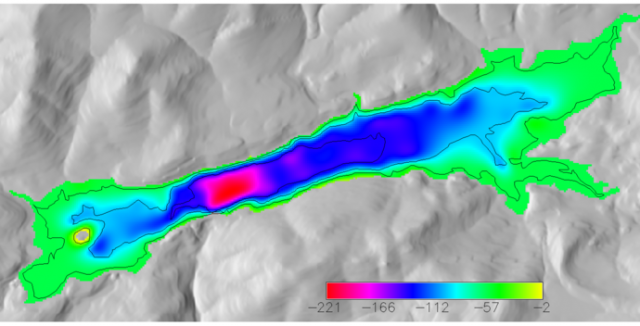 Topographical map of the area. You can set it for the desired area and print. A variety of activities at China Peak. Summer activities aren't on the web site during snow season. Lakeshore General Store which offers fishing licenses among other things. Winter Sports at Huntington Lake Lodge in the High Sierras: The Story of the First Annual Ice and Snow Carnival of the Commercial Club of Fresno, California by George Wharton James, published by The Radiant Life Press, 1916. Scanned by Google. Huntington Lake elevation from SCE updated every 15 minutes. SCE Big Creek Project water information for 2015. This is the place for public updates on lake levels and related information. Lakeview Association, LLC. is not responsible for the content of external web sites. We offer these links as a public service. Please report problem links to the Webmaster.